Leesa, launched in 2014, was among the first companies to sell its product directly to consumers online and to compress its mattress for shipping. The first mattress the company produced was the Leesa, followed by the Sapira, which took more than a year to design and develop. The Sapira differs from the Leesa mattress because it is constructed with several foam layers over a pocket spring core rather than 100% foam. The company and the Sapira mattress are consistently rated high by consumers based on the support and comfort of the mattress, the 100-night, risk-free trial period, and Sapira’s strong social impact initiatives (the company donates 1 mattress for every 10 sold, plants 1 tree for every 1 mattress sold, and supports local communities). Spring and foam hybrid: Sapira is constructed with steel pocket springs in its base layer that give the mattress strong pressure relief and little to no motion transfer. The 3 foam layers above the springs add comfort, bounce, and cooling. Edge support: The pocket spring technology allows the springs to go all the way to the edge of the mattress, meaning edge support is significant. 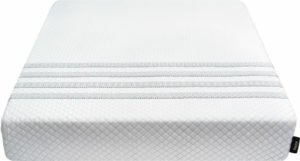 Support for heavier sleepers: The combination of pocket springs and foam gives more support to heavier sleepers than a traditional foam mattress. It is designed to support up to 350 pounds, but consumers as heavy as 450 pounds have reported sleeping comfortably. Compression shipping: The mattress is compressed before shipping and arrives in a manageable box. This means it can be moved to the right room and put in place on the bed base before opening and decompressing. Firmness: The Sapira mattress is described as too firm by lighter-weight sleepers (130 pounds or less). Weight: This mattress is heavy (the Queen weighs 115 pounds and the King weighs 142 pounds), making it difficult to manage once out of the box. Buy your Sapira mattress from Amazon. Leesa, the company which makes the Sapira mattress, is headquartered in Virginia Beach, Virginia and remains privately held by its cofounders, David Wolfe and Jamie Diamonstein. Prior to starting the company, Wolfe was a strategy consultant in various industries and Diamonstein was a mattress designer in a family-owned business for nearly 3 decades. After producing their flagship Leesa mattress in 2014, the two men spent more than a year designing their next product, the Sapira. The Sapira mattress is a coil spring and foam hybrid with a 5-layer construction that provides a higher level of firmness than the Leesa, and gives bounce without motion transfer. All components of the Sapira mattress are 100% American-made and each of the foams used is CertiPUR-US certified. The mattress itself is manufactured, compressed, boxed, and shipped in Mississippi, and the fabric for the cover is sourced from North Carolina. Sapira itself is not yet rated by the Better Business Bureau (BBB), but Leesa, its maker, has a B rating. Because the mattress only became available in late 2016, the total number of reviews is limited, but the 200 which are posted on the Sapira website show that 76% of customers give the mattress a 5-star rating and 11% of customers give the mattress a 4-star rating. The Sapira has a 4-star rating on Amazon. These programs and the company’s strong customer service policies resulted in Sapira being featured in national publications like Forbes and GQ within a few months of going to market. Performance foam: This 1.5” top layer is a high-performance foam that is hole-punched to maximize airflow and to provide bounce. Memory foam: The second layer is 1.5” of memory foam that provides pressure relief. Transition foam: The third layer is 1” of high-resiliency foam that sits atop the pocket springs. 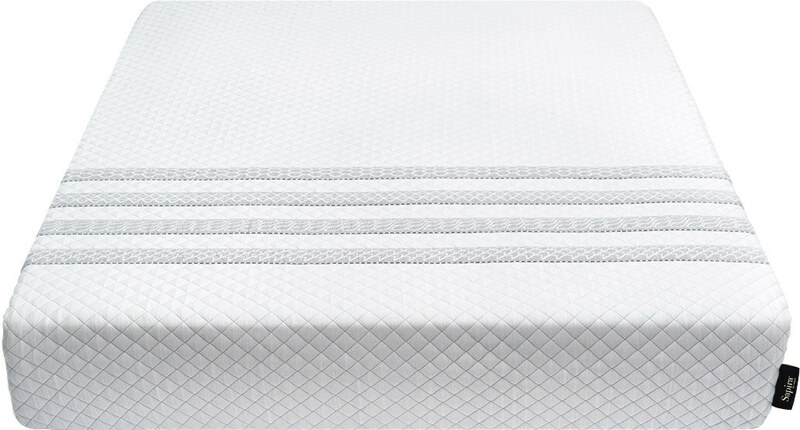 Pocketed coils: The core layer of the mattress is made from individually wrapped, premium-grade steel springs that provide support and minimize motion transfer. Base foam: The bottom layer is another 1” of high-resiliency foam that encases the bottom of the pocket springs. Cover: The Sapira cover is made from a single piece of poly-lycra blend fabric that wraps the entire mattress. It is woven tightly and is thick for durability. 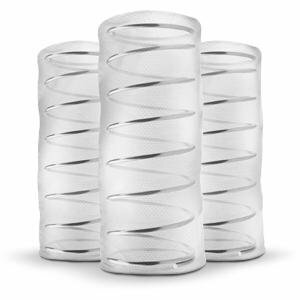 Edge support: The coil springs around the edges of the pocket spring layer are smaller and packed more densely to give strong edge support when you sit on or sleep near the edge. Frame compatibility: The mattress is designed to feel best when sitting on a firm, flat surface; solid or slatted bases are recommended rather than traditional box springs. If using a slatted base, the slats should be solid with no give, and Sapira recommends that they be no more than 3” apart. Certification: In addition to the hypo-allergenic quality of the foams in the Sapira mattress, all of them are also CertiPUR-US-certified. Purchase the Sapira mattress from Amazon. Sapira offers customers a 100-night sleep trial. If a customer chooses to return their mattress, Sapira will arrange a free pickup from their home if located in the continental U.S. There is a $100 pickup fee for returns in Alaska and Hawaii. Once the mattress is picked up, Sapira will refund the full purchase price. Sapira mattresses ship free to all 50 states but do not yet ship internationally. Once an order is placed, the mattress is made and shipped via UPS Ground (no expedited shipping is available). The production process takes 3-5 days and transit time ranges from 1-5 business days depending on your location. Each mattress is compressed, vacuum-packed, rolled, and boxed for shipment. Box dimensions vary depending on mattress size but all have handles for easy maneuvering. The Twin, Twin XL, Full, and Queen ship in a box that is 16.5” x 16.5” x 43.5”, while the King and California King ship in a 17.5” x 17.5” x 45” box. Take the box into the room where you will be using it. Remove the mattress roll from the box (avoid using a sharp object to open the box since you risk cutting the mattress). Place the mattress roll on your base. Remove the outer plastic wrap and unroll the mattress (it will immediately begin to expand). The quilted stripes on the cover go at the foot of your bed. There will be excess plastic on one side of the mattress. Cut it, taking care not to cut the mattress cover. You will hear a rush of air and the sound of the springs popping into place. It may take up a few hours for the Sapira to fully expand and a few days for it to fully firm up. Sapira offers a 10-year, non-prorated warranty on each of their mattresses. The coil springs and foam combination used in the Sapira mattress minimizes motion transfer. The foam layers above the springs absorb movement, meaning one sleeper will feel minimal effects when the other sleeper is changing positions or getting out of bed, while the springs themselves prevent sinking. Unlike 100% foam mattresses that give way around the edges, the Sapira’s pocket spring layer prevents most sinkage. The coils around the edges are smaller and packed more densely to give significant support when you sit on or sleep near the edge. The foams used in the Sapira mattress are all high density and should, along with the individually wrapped coil unit, give the Sapira a long life. The cover is made from a strong, tightly stitched poly-lycra blend that is highly durable. Because the Sapira brand is fairly new, its lifespan is not yet documented but there is no reason to think it would not keep its comfort level for the full 10-year warranty period if cared for as directed. On a 1-10 scale, with 10 being the most firm, the Sapira mattress is a 6.5 to 7 (there are no firmness options), meaning it is medium to medium-firm. It is reported to be too firm for sleepers who weigh less than 130 pounds and those who prefer side sleeping, but the mattress does soften over time and is designed to support up to 350 pounds without sagging or significant sinkage. The Sapira mattress does not have any special built-in cooling mechanisms, but all 5 layers are breathable. The 3 foam layers on top of the coil spring base draw heat away from the sleeper and the top performance layer is hole-punched for extra cooling and maximum airflow. After it is unboxed, the Sapira mattress has a slight odor that is typical for mattresses containing foam but it is less noticeable because of the coil spring base layer. Most customers report that the odor goes away after a few hours. The Sapira feels like an all-foam mattress on top but the coil spring layer gives it bounce and prevents horizontal motion on the bed. You won’t sink deeply into the top layers which aids in amorous activities and motionless position-changing during the night. The cover on the Sapira mattress is made from a single piece of poly-lycra blend fabric that should not be removed for washing. Instead, treat any spots or stains with mild detergent and cool water. Blot and dab rather than scrubbing with force and don’t oversaturate your cleaning cloth. Be sure to allow it to air dry completely before replacing bedding. The mattress cannot be flipped because of the layered construction but do rotate it every few months. Also use a mattress protector, and make sure you place the Sapira on a solid base.